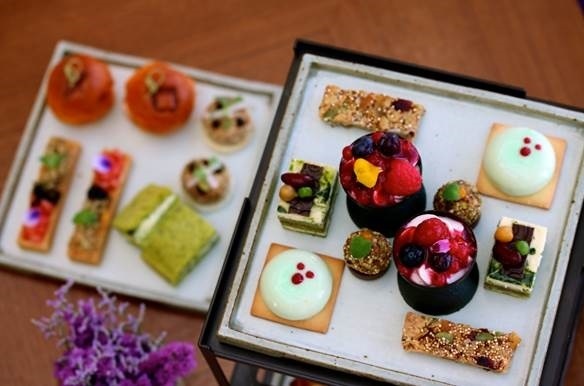 Park Hyatt Seoul’s The Lounge offers a specially prepared afternoon tea set, filled with superfoods to combat the sweltering heat. Savories and desserts included in the set features spinach, quinoa, salmon, blueberry and avocado, all of which are known to be beneficial for health. Premium green tea, also a superfood, is served with the set. At 18,000 won per person, guests can enjoy a glass of champagne. The tea set is served on a three-tier ceramic tray. The afternoon tea set is available from 2 p.m. to 5:30 p.m. and is priced at 38,000 won per person. It will be presented until Sep 7. For more information or reservations, call The Lounge at (02) 2016-1205. JW Mariott Dongdaemun Square Seoul’s BLT Steak restaurant presents BLT Steak Night, offering steak set menus at affordable prices. Every Tuesday is Steak & Fry Night. 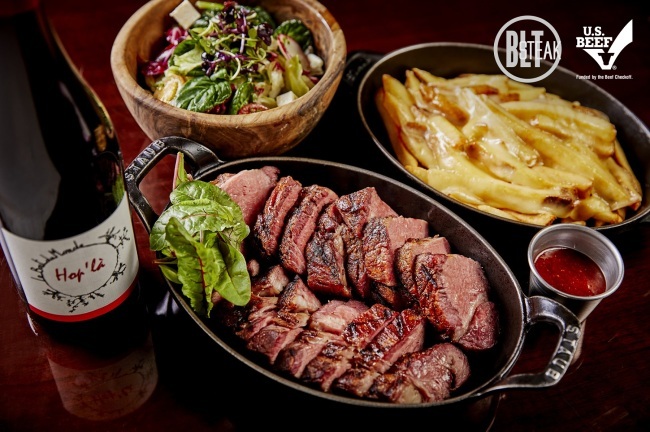 A set course menu, including BLT’s signature popover bread, salad, Black Angus chuck roast and a glass of either French or Italian wine, is offered at a price of 89,000 won for two people. Every Friday is Chateau Briand Night. A set course menu, including BLT’s signature popover bread, lobster cobb salad, prime-rated tenderloin and a glass of French natural wine, is offered at a price of 148,000 won for two people. 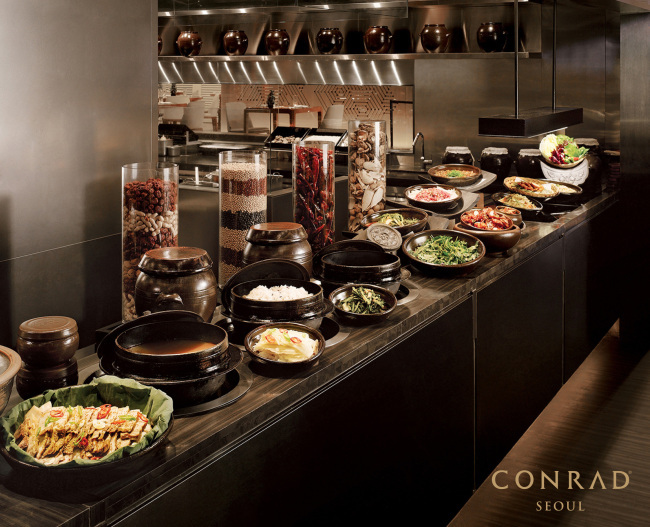 Conrad Seoul’s buffet restaurant Zest offers healthy foods for diners who are feeling under the weather. Dividing the buffet into four sections, Korean, Chinese Japanese and Western, Zest presents some healthy seasonal recommendations including octopus, abalone, eel and duck dishes. Energizing soup menus are the signature dishes, such as haeshintang of Korea and cordyceps soup of China. On weekday evenings (except for Mondays), an unlimited flow of premium draft beers is offered. Grand InterContinental Seoul Parnas added a new addition to its bingsu list, the Cloud Mango Bingsu. The new bingsu menu comes with cotton candy on top of a pole-shaped mango biscotti. The shaved milk ice is topped with mango puree, mango ice cream and fresh mango slices. Finnish-style berry cheese cake and mango jelly are served as side dishes along with the bingsu. The menu is served in a glass bowl, decorated with a dewdrop-shaped design, from Finnish tableware brand Iittala. 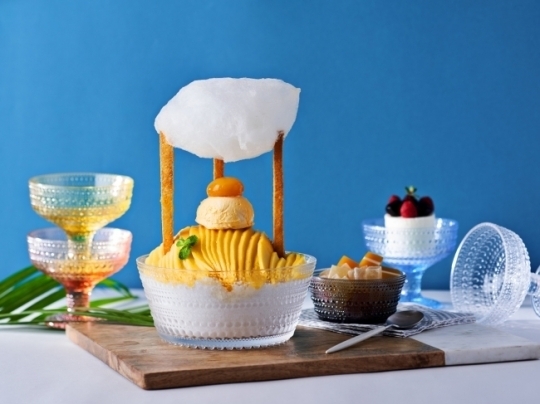 The Cloud Mango Bingsu can be ordered at the hotel’s Lobby Lounge until the end of August at a cost of 42,000 won. For more inquiries, call (02) 559-7603. The package is designed for people who are planning a summer escape in the heart of the city. With a night stay at the hotel, guests receive 50,000 won of credit, which can be used to pay for food and beverages at the hotel’s 12 restaurants. Free access to the hotel’s outdoor pool is offered, along with a beauty travel kit by local beauty brand Son & Park. The package is available until the end of September with the price starting at 230,000 won. For more information, contact Grand Hyatt Seoul at (02) 799-8888.